My mind is spinning with the information about neutrals and greys in my new book, and then I return to my painting of roses and struggle to see where I can apply it all…. I suppose the information needs to filter into my memory and will come out when it’s needed (I hope!). 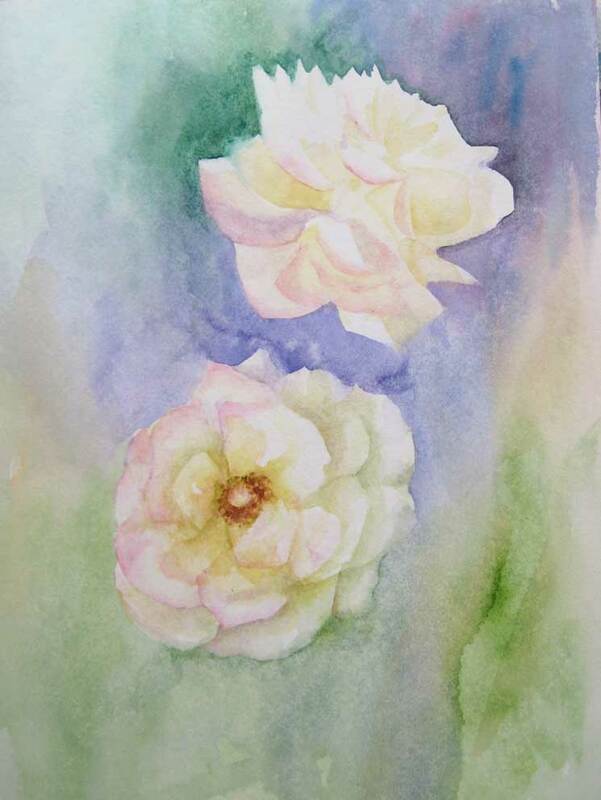 In the meantime I continued with the rose painting pictured, revelling in the colours. My second rose has a bit of a bouffant ‘do’, I think I got the proportions a bit out :-). The shading is slowly coming along, even though I lost my way in the middle of the flower – something to do with not seeing the total shape clearly. I also put more background colour in, and will probably make it darker as I progress to create some negative stalks and some leaves. Our small front garden has three rose bushes, all of which were here when we moved in… I wasn’t really a big lover of roses, but I’ve become quite attached to them over the past two and a half years. They’re all quite different – there’s a deep red, long stemmed single bloom variety with an amazingly sweet perfume (almost sickly sweet), a mutli-bloom candy striped pink and white one, and a small under-developed bush that only manages one or maybe two blooms a year… but when they appear they are so beautiful! This rose bush has just delivered it’s first blossom of the season, possibly the only one we’ll see, and it’s the most perfect full rose of soft yellow with a delicate tinge of pink at the tip of some of the outer petals. 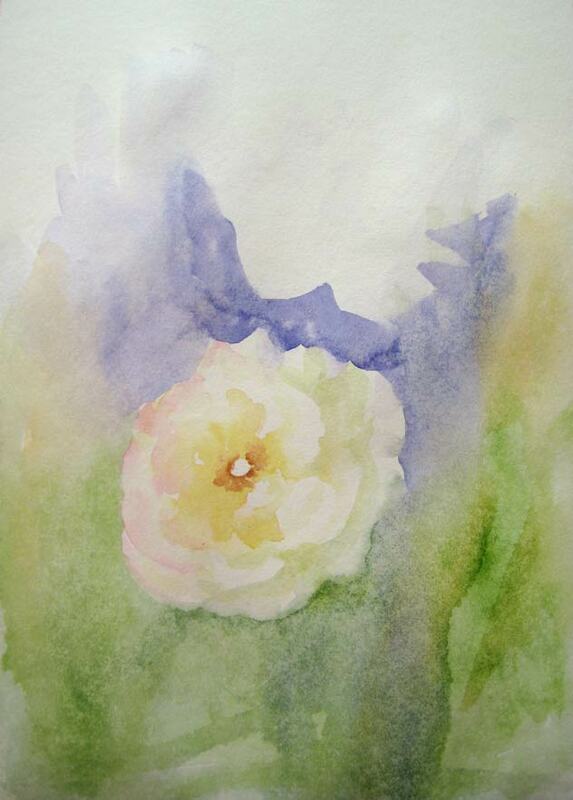 It’s enticed me to try a loose rose painting, my first of the year, with no pencil outline to guide me. 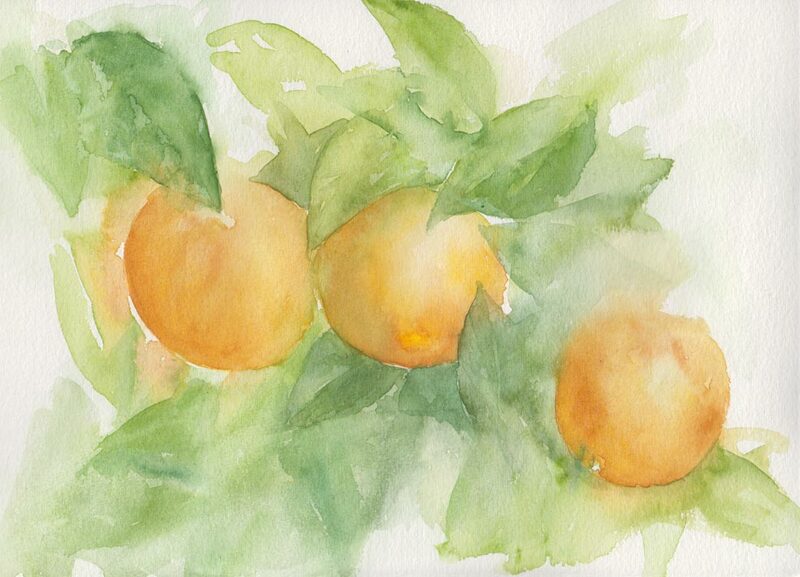 I admit, I studied a few online videos first to gain some ideas for technique – I have previously tried Jean Haines tutorials and today I found another artist, Trevor Waugh, who’s demonstrations are stunning. 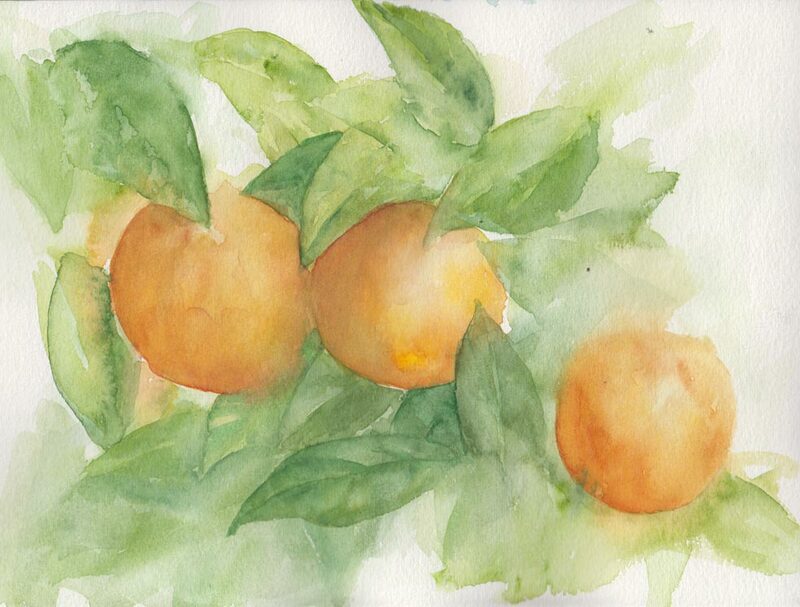 My effort is a combination of both techniques, I think, with my own freehand interpretations… I’m really pleased with the start I’ve made, although I got caught out by the speed the washes dried so there are a few hard edges in the background that need addressing later. You’ll maybe have noticed that I left a space for another flower? That’s a bit of artistic license as it only ever grows one at a time, but I thought it might make for a better composition. I think I’m learning that I’ve still got some way to go with ‘suggesting’ or imagining a picture. I still feel a lot happier painting what’s in front of me, mostly because the lighting is key to making it believable and I think it’s something that’s hard to get right when you’re making it up. 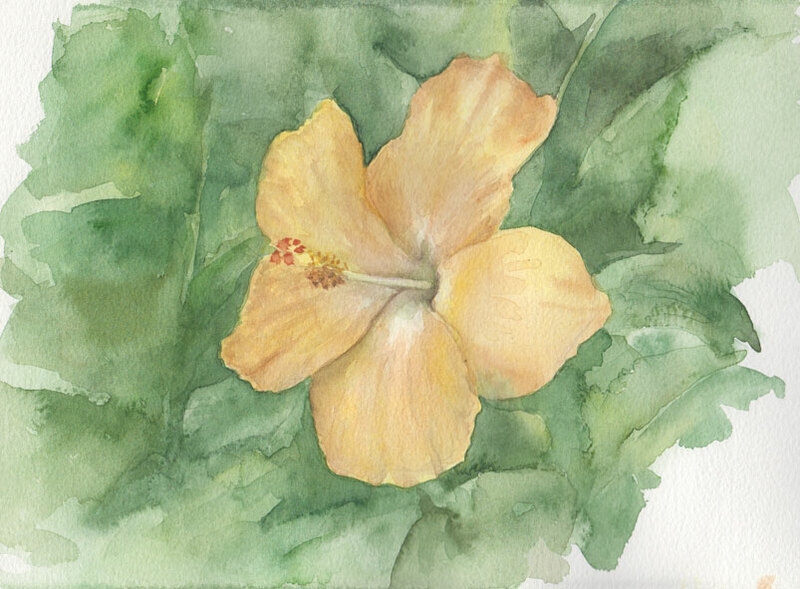 Following on from yesterday’s theme I thought I’d work on another piece that needed developing further from the initial wash – the yellow Hibiscus flower (Day 29). My aim here was to enhance the flower itself and also to deepen the foliage behind it to make the flower stand out more. It’s certainly looking more as I imagined it now, although I still think the leaves could go darker… trouble is I’m not sure how to get them there without adding a lot more layers (more research into mixing green needed!). I’m much happier with the flower now it has more depth, but my next challenge will be to get the effect with less ‘fiddling’, some areas were quite over worked in my opinion.